More than 120 years have passed since May Day was first celebrated as the workers’ struggle day. 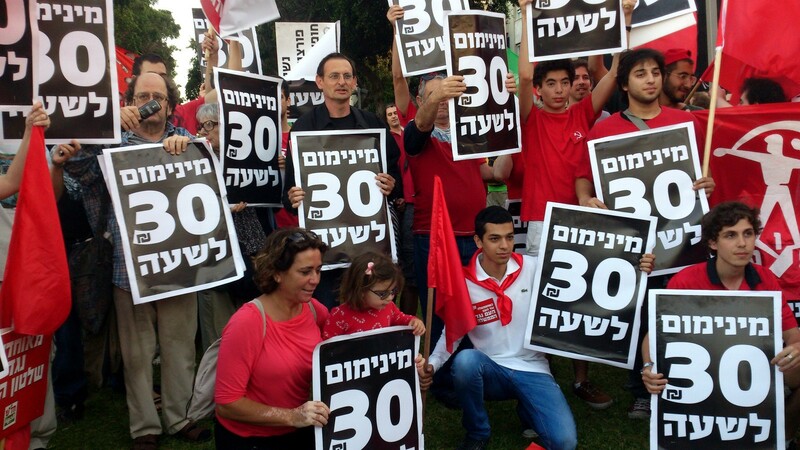 Despite significant progress that has been made in the past century, such as the inclusion of workers’ rights into the public discourse and protests, and progressive labor law legislation, many employers continue to overwork and underpay their workers, crudely violating the labor laws that are intended to protect workers in Israel. Even though the law regulates most of the rights of workers who are employed by Israeli companies, many of the employers break the law causing the workers situation to deteriorate. This is the reason why tens of thousands of workers, who are suffering from exploitative and abusive conditions, turn to nonprofit organizations for help. In this past year, Kav LaOved, alone, helped 30,000 workers employed in Israel, including reclaiming millions of shekels for breach of labor rights just for Israeli citizens. In most cases Kav LaOved serves vulnerable workers such as security guards or maintenance workers, hourly wage earners or contract workers, however, other workers employed by larger companies with good reputations, or people in education, healthcare, and even in high tech, also come to us for guidance. The growing trend of rights abuses in the labor market is accompanied by an increasing public interest in the clarification of labor rights. We see evidence of this in the statistics collected by “Kol Zhut” wensite which provides comprehensive information on the rights of Israeli citizens in general. Their 2013 database records more than 1,500,000 visits to their website. 27% of all visits were regarding employment and workers’ rights. This is an amazing figure compared to only 6% to 8% of all visits were interested in clarification of their rights regarding health, disabilities, and poverty. It is time to point a finger at the government for its role in allowing the violation of workers’ rights to become a common and growing phenomenon. It is strictly the government’s responsibility to enforce the law. The authorities are being negligent by not safeguarding the rights of workers, and in some cases, the negligence gives the appearance of being intentional. For example, Israeli companies seeking to hire Palestinian workers in the industrial areas of the territories are required to pay employer permit fees and other charges for workers basic social rights (which are often not even implemented). The state collects a 10% employer levy from companies hiring foreign agricultural workers, in the building sector the employer levy is 15%, and for the other employment sectors the state exacts up to 20% in employer levies, all adding up to the collection of millions of shekels by the government from companies that employ foreign workers. The employers often roll these costs onto the workers by cutting their salary to significantly lower than the minimum wage. Despite the fact that this type of damage to employment conditions is a common and wide spread phenomenon, the serious lack of authoritative enforcement by the government and passing the responsibility from one government office to another, leaves workers without safe-guards, while employers enjoy cheap labor under the protection of the state, which enjoys a large income. Often, the state does little to ensure the workers’ social rights and it seems that many times the state does not even attempt to protect them. For example, workplace safety regulations are taking a long time to be implemented, and meanwhile, according to a study published by the Knesset Center for Information and Research Committee, 7,381 workers were injured in construction in 2013 compared with 6,103 workers injured in 2009. The Ministry of the Economy employs only a few dozen inspectors to serve over 2.5 million salaried people. One might ask why. In addition, the Ministry of the Economy lacks translators who speak the languages of the foreign workers (such as the Thai language) causing the workers to feel helpless. These are just two examples of the many expressions of inefficient law enforcement. They show how the government is encouraging abusive employment practices while both employers and the government enjoy the income. The government is encouraging cheap labor practices at the cost of continued harm to workers’ rights. Thus, the family of a patient in need of full time attention is encouraged to hire a caregiver to work 24 hours a day 6 or 7 days a week, instead of sending the patient to a geriatric hospital at a high cost to the government. Also, Israeli farmers are encouraged to make foreign workers work at least 10 hours a day 7 days a week and live in containers or in chicken coups. In a situation where the neither the employers nor the government are protecting workers’ rights, there is an obligation to secure the rights of the economy’s vulnerable workers by other means. Unionizing migrant worker populations in Israel by type of employment will create a revolution in the labor market in Israel and will protect the rights of vulnerable workers. This plan of action becomes much more critical on the background of a dramatic decision made by the representative appointed to the worker relations in the Economy Ministry this week; the Israel National Labor Federation supported the employers in a collective bargaining agreement for foreign workers in the building and construction industries, an agreement that was prejudiced against foreign workers while protecting Israeli workers. I am hopeful that soon all the workers in Israel – hourly workers, contract workers, foreign workers, and Palestinian workers, as well as refugees and asylum seekers, who are too often denied their rights for the very basic conditions that are anchored in law for all Israeli workers such as minimum wage, a weekly rest day, minimal social benefits, and those workers who have experienced ridicule by employers and distain by a government that ignores their situation – will lift up their heads to confront the hard reality and say enough is enough.